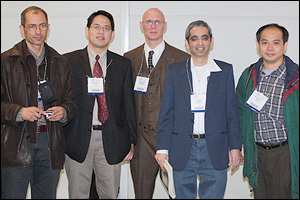 Chuan-Fu Lin (second from left) at the APS March Meeting in Pittsburgh. Also pictured are (left to right) Ajmi Hammouda, Ray Phaneuf, Sanjay Khare and Hung-Chih Kan, all collaborators in the NSF-supported work on "Nanopatterning GaAs(001) as a Probe of Atom Scale Mechanisms for Growth Instabilities". Department of Materials Science and Engineering (MSE) graduate student Chuan-Fu Lin, advised by Associate Professor Ray Phaneuf, was awarded second prize in the Modeling and Simulation category at the 2009 Graduate Research and Interaction Day (GRID) for his presentation titled "Kinetic Monte Carlo Simulations of Nanostructure Evolution during Unstable Growth on Patterned Surfaces". Lin, who collaborates with fellow MSE graduate student Krista Cosert, studies the evolution of nanopatterned GaAs surfaces during epitaxial growth. His results indicate that given the existence of a type of diffusion barrier at the edges of steps (the Ehrlich-Schwoebel barrier), patterning can be used in directing the spontaneous self organization of nanometer-scale hillocks or "mounds" with an intriguing series of periodicities as the growth temperature is changed. Lin and Cosert also presented their work on the subject at the American Physical Society March Meeting in Pittsburgh this year in a focused session on Directed Self Organization of Nanostructured Films, which Phaneuf chaired.